The duties for the SkillsUSA Wisconsin House of Delegates is critical to the operation of our organization. The duties for each voting delegate are important and it is equally important that each voting delegates is aware of their duties and carry them out diligently. We recommend TWO enthusiastic members to represent your chapter as voting delegates. Your voting delegates are two officially registered members who are dedicated to SkillsUSA but might not sure of a competition they want to compete in. Being a voting delegate gives students the opportunity to elect next year’s State Officer Team, impact the direction of the state organization, and gives them the chance to see what State Conference has to offer. 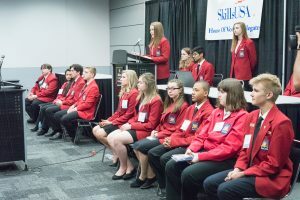 SkillsUSA Membership: All Voting Delegates are required to be official SkillsUSA members by the March 1. Assist with the distribution of lunches and judges gifts on Wednesday of conference. This gives the voting delegates an opportunity to see the competitions in action.